The single-edged knife was particularly created for Japanese cuisine as a sashimi knife and a pointed carver knife, among others. The sliced food easily slides away from the knife; the food's cross-section is beautifully cut; and the food is also characterized by a pleasant mouth-feel. While the angle wherein the blade hits the food is more acute resulting in a sharp cut compared to a double-edged knife, a single-edged knife has the disadvantage of splintering more easily. *Single-edged knives for left-handed people are custom-made and are sold at 1.5 times the usual cost. Double-edged knives are sharpened at almost the same angle on both the front (50 degrees) and reverse (50 degrees) sides. Food is sliced straight, and these knives cut evenly on both sides so they can be used by both right-handed and left-handed people. *Western-style kitchen knives (gyuto, slicers, santoku, petty knives, etc.) are double-edged. *We also have double-edged knives that are slightly angled for right-handed people. A honyaki knife is a kitchen knife made from one sheet of steel. Knives that are not honyaki and are generally available on the market that are called “kasumi” knives have cutting blades that combine hard steel and soft iron as their base material. Kasumi knives are easy to handle, easy to sharpen and are affordable compared to honyaki knives. 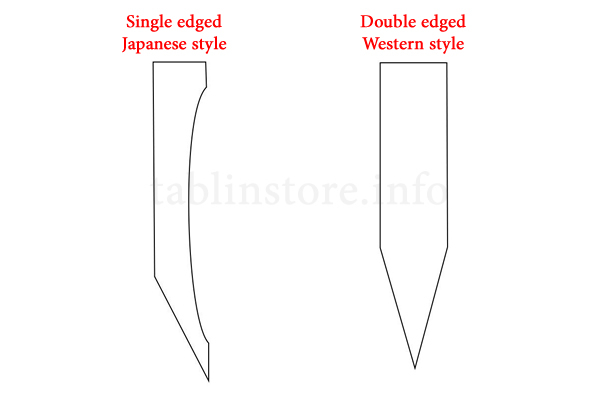 As a disadvantage, single-edged Japanese kitchen knives curve slightly after many years of use. A curved knife may break if undue pressure is placed on it so we recommend having it repaired in a knife specialty store. Honyaki knives are harder and are equipped with a durability that allows them to cut for a long time. The uniquely beautiful pattern on a honyaki blade is appealing, and is also reminiscent of a Japanese sword. The blade will not curve after many years of use, but on the other hand, it splinters easily and requires advanced sharpening skills because it is very hard. Moreover, honyaki knives are expensive because the manufacturing process is very time-consuming, and only highly-skilled craftsman can make these knives. These knives are also made-to-order so please inquire about delivery times. 3. What is Honbazuke Hand-finishing? Honbazuke is a sharpening process that is conducted right before a new knife is used. A craftsman sharpens the knife on a whetstone for additional sharpness. Only knives that are sharpened on a whetstone by hand upon delivery from the maker and have sharpened blades (honbazuke) are sold at tablinstore. Many inexpensive kitchen knives are only sharpened by machines so we are confident that you can tell the difference in our knives' cutting ability. Steel knives cut well but will rust if they are not cared for properly. After using your knife, wash it well, pour hot water all over it and leave it to dry. This will prevent rust and is also hygienic. If you are going to store it for a long time, coat it thinly with oil, wrap it in newspaper and store it in a place with good ventilation. Please note that the sizes of Japanese kitchen knife blades differ. Sashimi and Usuba knives have a “machi” while pointed carver knives and others do not. Dimensions shown for knives with a “machi” such as sashimi knives include the length from the machi to the tip of the blade. Tablinstore accepts orders for custom-made kitchen knives. We can make a customized knife that's uniquely yours – from gyuto knives, sashimi knives, pointed carver knives; to knives with your preferred shape, size, blade material, sharpening angle, handle specifications, and left-handed or right-handed requirements. Knives are structured in various ways but with regard to Japanese knives which are single-edged, their rear parts are formed to have slightly curved surfaces called “urasuki.” The curved surface reduces frictional resistance when cutting ingredients so that they would not easily stick to the knife, and it also creates sharpness. 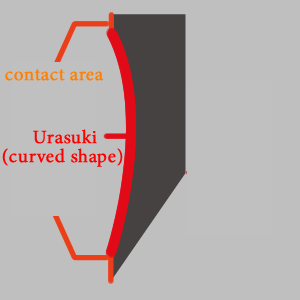 In addition, urasuki is created by a craftsman because during re-sharpening of the rear surface, the parts that hit the whetstone become small surfaces therefore the knife can be sharpened for just a few number of times, facilitating the knife’s maintenance. The Japanese kitchen knives at tablinstore have inscriptions on the front and the back of the knife. (Some knives do not have inscriptions.) Especially with inscriptions at the back of the knife, generally speaking, knife smiths carve their seals here. After carving, the craftsman who attaches the blade attaches it so in the case of single-edged Japanese kitchen knives, “urasuki” and other inscriptions may be erased or become less visible at the processing stage of the blade material. In Japan, it is known that this is proof that the knife has undergone a good blade attachment process and the knife is of a superior quality. However, please consult us before you purchase if you would like a knife with a clear, distinct carved seal. *These are not defects so please note we do not accept exchanges for these knives. *An example of an inscription at the back of a knife. Please note that knives with clear, distinct characters in their carved seals are rare.